Kneale Mann | Leadership: How Does It Make You Feel? We are inundated by information, pitches, news, content, blogs, offers, podcasts, emails, phone calls and the question remains: are we getting any further? The blogosphere is fraught with economic news and predictions while we all try and stay focused. The 800lb gorilla is stomping on our collective skulls while we attempt to stay positive. We are looking at each other for guidance and answers but in the process forgetting that others are doing the same to us. Some estimates say that we sift through thousands of images and pieces of content every day. We have become masters at weeding out what we don’t need and getting to what we do need. When I was buying my current car, I did my homework. I test drove 12 different vehicles, performed in depth price comparisons, examined options, pros and cons, and ended up buying the car that I wanted from the start. I had over thought it. It wasn’t my homework that sold me; it was what my best friend said as we stood in the dealership parking lot one summer evening. He turned to me as we looked at three different models of the same car and said; “Dude, get the one that will make you smile”. The best radio promotion I have ever been a part of was entitled “24 Hours In Vegas”. 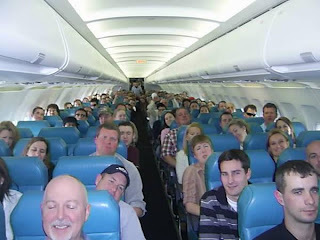 Unlike most radio contests, we did not ask listeners to wait for the sound of the clown horn or be placed on a waiting list or answer a skill testing question, we just gave away seats on our chartered plane all the time. I had 180 seats to fill and it was a blast. We kept our focus on how it feels to be told without notice that you are going to Las Vegas. Winners received two plane tickets, that’s it. No hotel, no spending money, no rental car, no taxi chits, a plane ticket. We took off at 10am on Wednesday and left Vegas at 10am on Thursday. Listeners were left to fend for themselves and live large. There were grown men crying, women screaming in disbelief, and the morning we took off we had a plane full of excited people. It wasn’t about ratings, or the radio station, it was about connection. There were no complaints or whining about extras. The plane ride home was full of tired but excited people sharing stories of their adventure. New friendships were formed, some stayed up all night, some grabbed a hotel, two couples renewed their vows, and not one person missed Thursday’s flight. It was a team of people sharing an experience. In a time when companies are making cuts and trying to find the message that will cut through, perhaps it's time to find out how your message or product or service will make them feel. With radio promotions, it was important to stay within four main prize categories: money, trips, cars and things people don't have access to experience on their own. No one would turn away the first three, but it is the last one that will last a lifetime. The iPod isn’t about high quality audio, it’s about freedom. TED2009 on right now is not just about smart people talking, it's about showing others they can dream and think big. Social media is not about collecting friends, it’s about sharing with others.